Way better than The Da Vinci Code. Actually, even in the books this is the more interesting one, The Da Vinci Code just got more hype because it attacked Jesus Christ himself. Everyone knows Jesus, but who the hell knows the Illuminati? Did you, before you saw this movie? I thought so too. I guess that explains it. The thing about Dan Brown is that he likes to mix the geeky with the adventurous. He likes to talk about anti-matter and all those Physics crap you wish you understood while doing an exclusive Italy/Vatican version of the Amazing Race. It is okay to get bombarded with geeky stuff when you are reading, besides that is the conventional way of learning new things, but if you use a different medium like a movie, you are better off doing a documentary, lest your characters end up like walking encyclopedias. 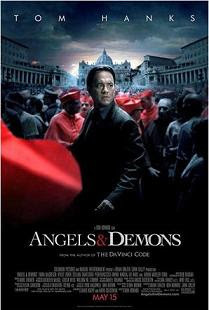 In this movie, Langdon is the talking encyclopedia of symbols and the arts. Vittoria is the talking encyclopedia of all things Physics and she doubles as a Babelfish translator too. You want help with your Latin? This is what they do for the first 30 minutes or so before they do their own version of the Amazing Race. So the first parts are kind of boring but highly informative if you are into those kinds of things. When the Amazing Race begins, the musical score, the angle of the shots, the transitions, and the chase scenes keep you at the edge of your seat. Fun fun fun. Adrenaline rush. Not one dull moment. They play with the ending a little. To those who have not read it yet, they would probably think that it all ends after the helicopter scene. Well it does not. So there are like two climaxes actually. I think I like the ending here better than in the book. Of course, there will always be deviations from the book but I think the director has actually improved the storyline. The ending in the book is a letdown after all the excitement. It is different here in the movie. They have done a pretty decent job, making it more adaptable as a visual experience. I remember that the Silas of this book was an Arab guy who even kidnapped Vetra and locked her up in a tower. None of that here. No familial relationship either between Vetra and the research partner. Ayelet Zurer is okay but I still would have wanted to see Monica Bellucci running around the Vatican and cursing in Italian. So what if she does not fit the role (Vetra is not supposed to be beautiful) they could always use prosthetics, HAHAHA! If I remember correctly, the Vetra in the book is a lot more fierce, the one here is like a toned down version. The story gives a lot of insights about the Catholic Church as an institution, how they conduct ceremonial traditions and stuff. So it is a perfect opportunity to pique your curiosity. But of course, be warned that this is still fiction and we actually do not know how accurate it is. For all we know, Dan Brown and Akiva Goldsman are just messing with us, so it is still better to satisfy that curiosity by doing your own research. I have decided to give it only 4 stars because I was really bored with the talking encyclopedia parts. I was hoping that they could have found a better way to present their facts but overall, the film is worth the admission ticket. Also, less points for not casting Monica Bellucci as Vittoria! HAHAHA. Yes, Ewan McGregor is very effective as the Camerlengo. He manages to effectively give an air of enigma to the character but still you could not help but give your sympathy to him. You just could not read him. Is he a good guy? Bad guy? Cool acting, better than Tom Hanks. HAHAHA.